As we come down the home stretch I reflect on the last month I’ve spent traversing the Canadian landscape to visit our country’s western National Parks. The diversity of habitats we set up our traps in was very interesting to explore, everything from mountainous highlands to grassy valleys to humid bogs. It’s amazing how your perspective changes when you immerse yourself in the environment. When you bring your face closer into the habitat, insects and their behaviour become much more apparent. The opportunity to collect and sift through those insects under a microscope, and then sort them into their various taxonomic Orders adds to the feeling of unearthing a whole new world of organisms that many people would normally dismiss as annoying pests. In some of the parks we held demonstrations for the campers to see just what we were doing in each park, and I was able to share the feeling of discovery with the many children that came to view our insect displays. Their unfiltered enthusiasm was the best part of our public demonstrations and reminded me exactly why I entered the field of zoology in the first place: the desire to understand the planet’s wildlife and to find answers to all my questions. I’m confident the future of entomology will be in good hands with children like those I met. Also, while crammed into this RV (like deerflies into a malaise bottle from Elk Island National Park, AB) one of the most important things I’ve learned was that it is crucial that the crew gets along. It is especially true with all the bumping into people and stepping over each other that occurs in this kind of working environment. And I find myself very fortunate that we did, otherwise it would have made for one very long month. So now that we’ve re-entered Ontario I’ve officially been to three new provinces for the first time. I got to splash about in the Pacific Ocean from the shore of Pacific Rim National Park, BC; and view the Rocky Mountains from Waterton Lakes National Park, AB; and search for burrowing owls while being barked at by a huge colony of prairie dogs in Grasslands National Park, SK. In fact, every park we stopped in was another new experience I could add to my list. It has really been quite a journey, a one-of-a-kind experience, and I’m glad I was able to participate in it. Who knows what’s in store for the BIObus next summer, but I’d be lucky if I was part of it again. We recently crossed the provincial border back into Ontario and it hit me that we’re almost back home! We spent the last four days travelling, but today we decided to take a much needed break from the road and spend some time in Pukaskwa National Park. We hiked along Lake Superior and were treated to some great views, which was a great way to end our trip. Lake Superior is the largest of the Great Lakes, as well as the coldest. We couldn’t argue with the latter when we took a very refreshing swim after our hike. I was happy that we got to spend some time in an Ontario park. The views were very inspiring and just what we needed after spending the last few days cooped up inside the bus. 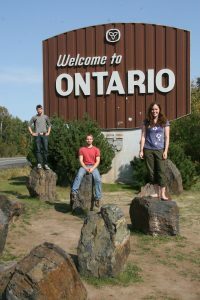 The BIObus crew is back in Ontario! We certainly had a very adventurous summer and got to see many interesting animals and landscapes. It was great to see the ocean, the mountains and the prairies, but when we got back to the Canadian Shield it felt like home. Tomorrow is the last day of the BIObus journey. We’ll return Guelph after our last day of driving and be forced to rejoin civilization. I’m sure we’ll all be glad to get back to the comforts of home, but we’ll always remember what an unforgettable experience this was.